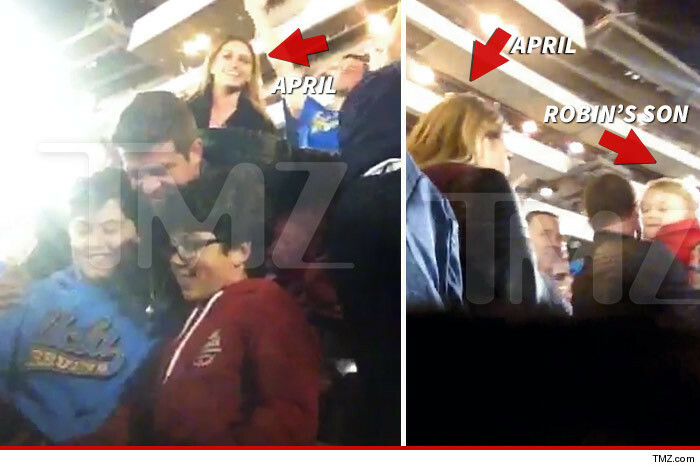 Robin Thicke must be serious about his new girl ... because she's now hanging out with his kid. Thicke, his boy Julian and his super young GF April Love Geary were snapped at the USC/UCLA game at the Rose Bowl Saturday night ... where they got a good view of the Bruins whooping the Trojans. As TMZ first reported, while Thicke has been coy about his dating situation, 19-year-old April has been going full bore, posting photos that were snapped inside Thicke's home. One thing about April ... she LOVES the spotlight. Robin Thicke -- Who's Been Sleeping in My Bed? A Young, Hot Model!